On the heels of my “lighten up” post, encouraging us to not take ministry so seriously, I thought I would give you a tangible way to make your home ministry chocked full’o laughs. One person asks questions and the another person answers every question with the word: “sausage”. You have to answer the question by saying, “sausage” and keep. a. straight. face. For a kiddo answering the question with “sausage” and NOT laughing and smiling is hard (but a good practice in self-control). And for the other little guy asking the questions, he gets to flex his creativity muscles in coming up with questions to provoke a giggle. Quade taught us this game while I was driving the car. There was almost a laughter-induced car accident when I heard Price asked, “What’s the name of your girlfriend?”…to which Quade had to answer, “Sausage”. HA! We’ve found this to be a handy little distraction while waiting for food at a restaurant. Or a great way to change the tone of a “too serious” or “whiny” mood during family dinners (not necessarily with a main course of “sausage”, mind you). 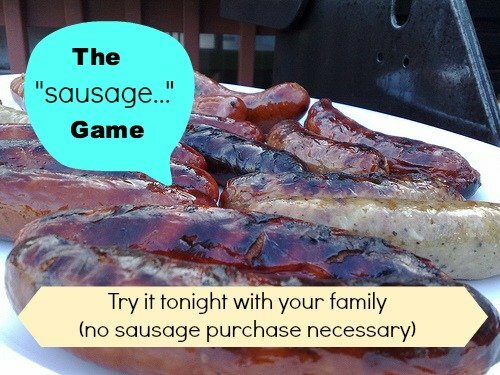 Because time spent together around the table, sharing laughter over “sausage”, as a family…is simply the best. Right? Let me know if you play with your family & tell me the best laugh-producing question you hear (so I can use it during our game). You have a chance to win a copy here on my blog…woohoo!!! Giveaway ends May 7th, 2013. You can tweet about the book, comment below, or like the Adventures in Odyssey fan page on Facebook. I haven’t enjoyed dinner time the last year or so. I would LOVE to win a copy and enjoy our family time again!! oh friend, I’m sorry. I get that. We have gone through long seasons where dinners like more training occurs than actually eating or joy. Hope you win a copy too! Ha Ha Ha!!!! I used to play the “sausage” game with my middle school girls at church–never thought about teaching it to my kiddos. I love hearing my 4 yo ask say, “So Daddy, tell me the best part of your day today?” Sweet! Thanks for the fun giveaway! hee hee. Quade actually learned it at his drama camp last month. What a sweet tradition…sharing high points. thanks Julie!! she’s so awesome. and yes, those are excellent traditions. (I LOL’d for sure…fortunately I was at a stop light when I read this so there wasn’t an LOL induced car accident). Growing up I loved how my dad read a chapter from Proverbs every night as we were finishing up dinner. After a while we started memorizing chapters because we had heard them so often, so he would read a verse and pause before saying a word, and my sisters and I would giddily say the word to “fill in the blanks” if we could remember. I’ll never forget those nights! how beautiful Katie! absolutely LOVE that tradition. Thank you for sharing. Funny! We don’t have many traditions around the table other than always eating together and sharing the events of our day. I love your sense of humor! SAUSAGE!